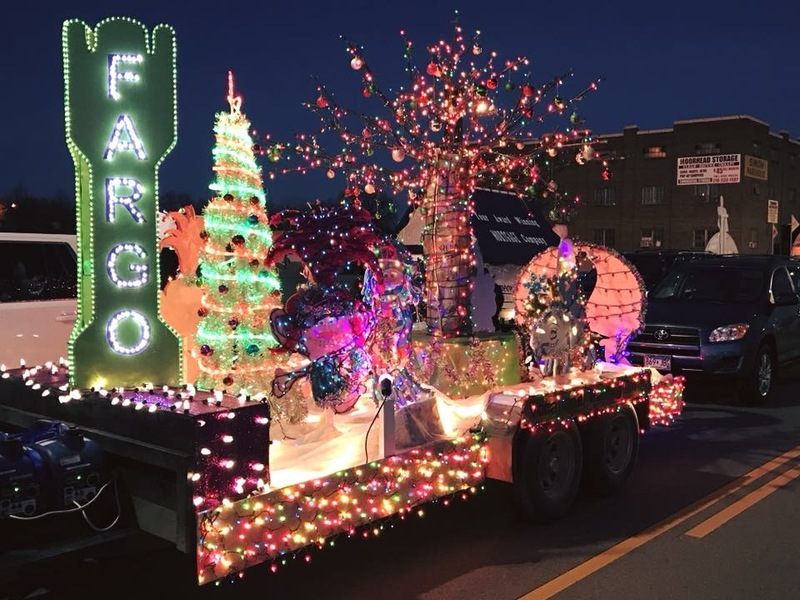 Presented by the Downtown Community Partnership and sponsored by Xcel Energy, the parade attracts thousands of spectators throughout the Fargo-Moorhead community and includes hundreds of participants that decorate their entries with lights. This magical evening will feature spectacular parade floats, marching units, equestrian entries as well as our Mayors, City Council and Commission members. The parade leaves Downtown Moorhead at 6:30 and continues through Downtown Fargo. 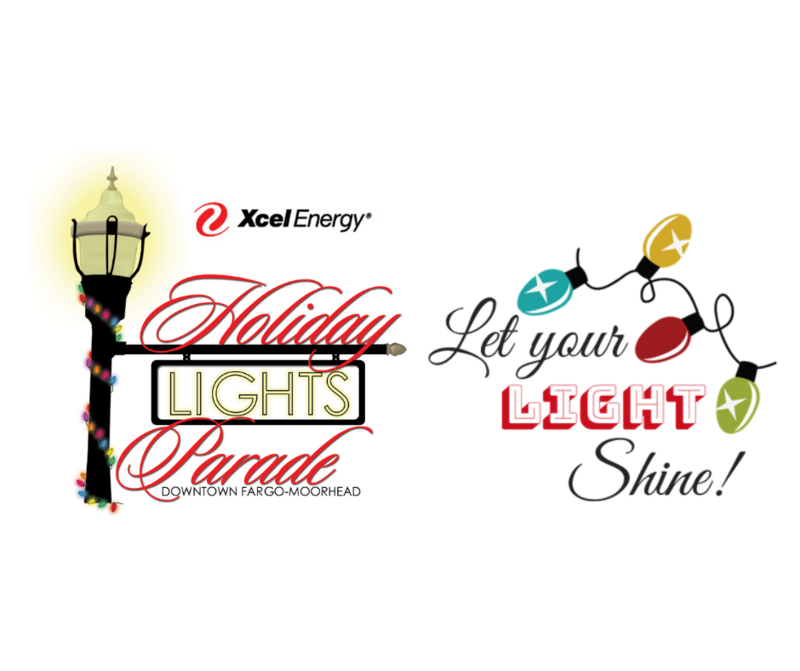 This year’s theme is “Let Your Light Shine” with the 2018 Xcel Energy Holiday Lights Parade Grand Marshal, North Dakota Senator John Hoeven. As Senator, Hoeven continues his efforts to build a pro-growth business climate for the state. With economic growth comes greater opportunities for investment in our communities and an enhanced quality of life. Fargo’s vibrant Downtown embodies the growth and prosperity of our state, and it is a fitting place for Senator Hoeven to mark this joyous season as Grand Marshal of the Xcel Energy Holiday Lights Parade. Parade attendees are encouraged to utilize the Fun, Fast, and Free LinkFM the night of the parade. Parking will be available at the Moorhead Center Mall and LinkFM will shuttle attendees Downtown before the parade until 5:30 p.m. LinkFM will not run during the parade. LinkFM will resume service after the parade from 8:00 p.m. to 9:00 p.m. There will be two LinkFM buses on route to reduce congestion as well as decrease wait times after the parade. Visit​ ​http://matbus.com/news-events/matbus-news/post-detail?id=5beadf7b98bdfffdab80ca86 for more info on LinkFM. Parking is also available in all city lots for free after 5pm. This includes the newly opened Roberts Garage which has hundreds of spots available. Visit​ ​​http://downtownfargo.com/news/​ for more ideas on where to park. There will be no parking on 2nd Ave. N. between Broadway and the alley beginning at 1pm. There will be no parking on Broadway between NP Avenue and Sixth Street in Fargo starting at 4 p.m. Broadway in Fargo will be shut down to traffic starting at 4:00 p.m​. ​Center Avenue between 11th Street and 8th Street in Moorhead will close at 5 p.m. and NP Avenue between Broadway and the Red River in Fargo will close at 6 p.m. All roads besides 2nd Ave. N. are expected to reopen by 8 p.m. Main Avenue, Seventh Avenue North, University Drive and 10th Street will remain open. 2nd Ave. N. From Broadway to the alley will reopen at 10 p.m. 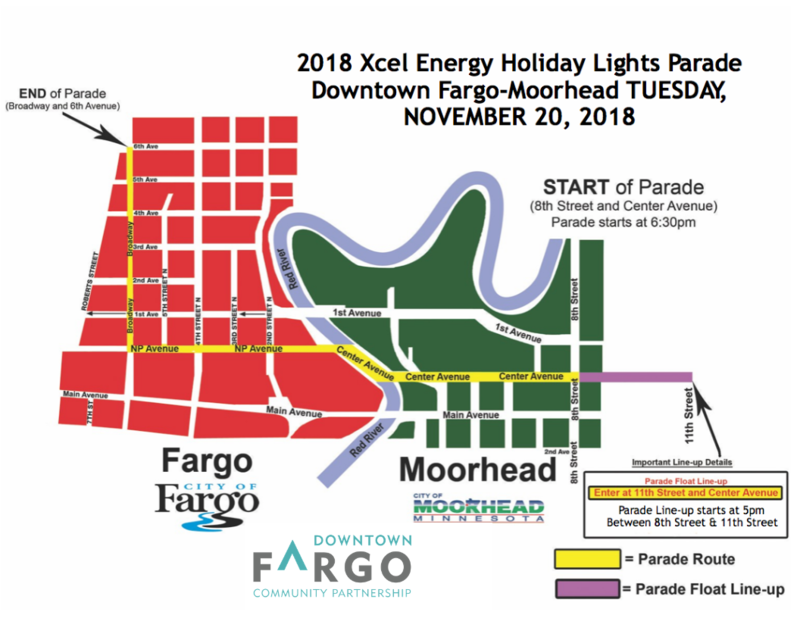 The 2018 Xcel Energy Holiday Lights Parade will be held on Tuesday, November 20, 2018 at 6:30pm. Parade Line-up will begin at 5:00pm between 8th Street and 11th Street in Moorhead, MN. Please enter at 11th Street and Center Avenue.